Salte en su propia quad y explore la estación de Undoolya en esta visita guiada desde Alice Springs. Explore de forma segura la propiedad, la estación de ganado más antigua en funcionamiento en el Territorio del Norte, mientras recorre caminos y arbustos secos a lo largo de las cordilleras, mientras aprende sobre la historia de Australia Central, la vida silvestre y las estaciones de ganado con su guía. Este tour para grupos pequeños está limitado a 10 personas. Las bicicletas son totalmente automáticas; No se requiere licencia o experiencia previa. Recogida y traslado al hotel incluido. A great morning spent on the working cattle farm for the quad bike tour. Well run and interesting as well as fun. We had a great time quad biking, it's been real fun! Great to see some nature and how everything works on a cattle farm. Professional, informative, and fun. Clealry they take what they do for a livelyhood AND for the tours seriously and it shows . Excellent ! Rien à redire si ce n'est qu'on aurait aimé que cela dure plus longtemps ! 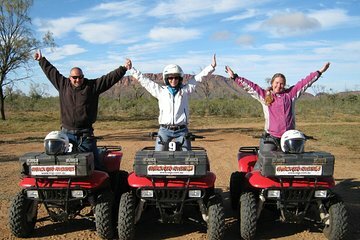 Had an absolute blast on the quad bike tour! Extremely knowledgeable guides and beautiful landscapes. Something a bit different but really interesting. Done this before and was even better second time around. It was interesting to hear first hand the running of the cattle ranch. Rusty was an excellent and informative about a land he loved. Do this if you get the chance. Fantastisk upplevelse som jag gärna gör om! Guiden var mycket kunnig och vänlig. Fastän jag var den enda som bokat den dagen, så blev turen ändå av. Det är jag jättetacksam för! Those quad bikes are so powerful. Really enjoyed it!! The guide was exceptionally friendly. There were only 4 people including the guide. Saw 2 wild kangaroos. Highly recommended.